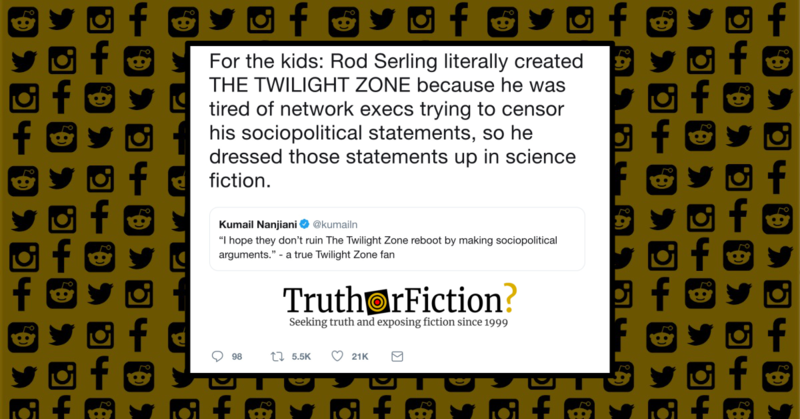 Did Rod Serling's 'Twilight Zone' Use Sci-Fi to Push Politics Past Network Censors? - Truth or Fiction? Jordan Peele’s “Twilight Zone” reboot led to claims that it was either “newly political” or upholding Serling’s legacy. The beginning of April 2019 also marked the premiere of the third television iteration of The Twilight Zone. This time, Rod Serling’s mid-century television classic series was rebooted with producer Jordan Peele at the helm. Finally, the new revival also features Jordan Peele as both producer and narrator. The filmmaker behind Get Out and Us has hardly been shy about his liberal outlook. Just recently, he stated that he “doesn’t see himself” casting a white man as a lead in the future because he’s “seen that movie.” In literally any other context, judging someone by their skin color is the definition of racism. Peele may have the right to hire whomever he wants for his movies, but I have the right to criticize his reasons. So far, Peele’s racial preferences don’t seem to be affecting the series too badly since at least one of its episodes has a white male lead. However, some upcoming episode descriptions, such as one involving a racist cop who shoots a black teenager, still promise some foray into racism. For now, we just have to focus on other ways the revival undermines the original. Are they just rehashing the traditional stories of the Twilight Zone and just going full SJW with it? Basically a STD flare up on another franchise? Though networks of the period avoided tackling uncomfortable topics like the Holocaust in traditional television dramas, Serling often exploited his show’s fantasy milieu and allegorical approach to storytelling to evade the kind of censorship that constrained more realistic programs. CBS network programming head James Aubrey might complain that sponsors avoid such material like the plague — after all, how do you explore the Holocaust and then sell toilet paper or underarm deodorant? — but Serling always stuck to his guns. … Serling recalled in his last interview, before dying during heart surgery in 1975 the age of fifty, that he was motivated by his disgust at postwar bias and prejudice, which he railed against so virulently that he confessed “to creating daydreams about how I could… bump off some of these pricks.” But writing ultimately covers more ground, and Serling confined his daydreams to television and film (he famously co-wrote Planet of the Apes, another buffet of Cold War anxieties served up as an alternate-reality blockbuster). The network’s censorship removed many of the painful truths regarding the prejudices in America during this time. Serling would turn to the avenue of science fiction in order to escape this kind of censorship; in the words of Serling, “You know, you can put these words into the mouth of a Martian and get away with it.” Serling’s desire to get away from censored forms of media led to the creation of The Twilight Zone (1959-1964), a science fiction series that showcased people’s greatest fears ranging from alien invasion, death, ghosts, and even the effects of the Cold War on American society. Serling had also learned his lesson from his earlier dust-up with the Daily Variety. In his interview with Wallace, he demurred about whether or not his new show would explore controversial themes. “…[W]e’re dealing with a half-hour show which cannot probe like a [Playhouse 90 production], which doesn’t use scripts as vehicles of social criticism. These are strictly for entertainment,” he claimed. After Wallace followed up, accusing him of giving up “on writing anything important for television,” Serling easily agreed. “If by important you mean I’m not going to try to delve into current social problems dramatically, you’re quite right. I’m not,” he said. Many histories of Serling and his creation touched on its subversive and covert themes —which were indeed designed to foil censorship attempts by network censors when it came to the political issues of the day. In the clip above, Serling expresses disgust at censorship he faced in his attempt to depict the lynching of Emmett Till in the lead-up to the show’s debut.